Full of red dye, super chewy and a fruity taste that you can't quite put your finger on. Which is why it was hard to duplicate the taste for swedish fish cupcakes. As luck would have it I got it right the first time! I decided to make these for my daughter's birthday celebration in her classroom. Which happened to be on a Monday and we had a REALLY busy weekend planned. Because of my extreme lack of time these needed to be super easy to make. Which is why I chose to use a cake mix and pre-made icing. Sandra Lee would be proud! But I did use my pastry bag and tip #104 instead of the snipped off ziploc bag she's so fond of!! 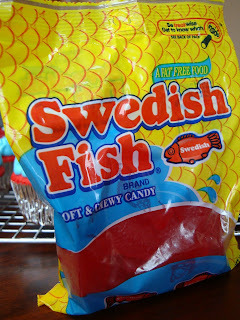 But they do taste just like swedish fish! And be forewarned, they are super sweet as well. Using kitchen scissors snip each mini swedish fish into four pieces. A knife just doesn't work for this. 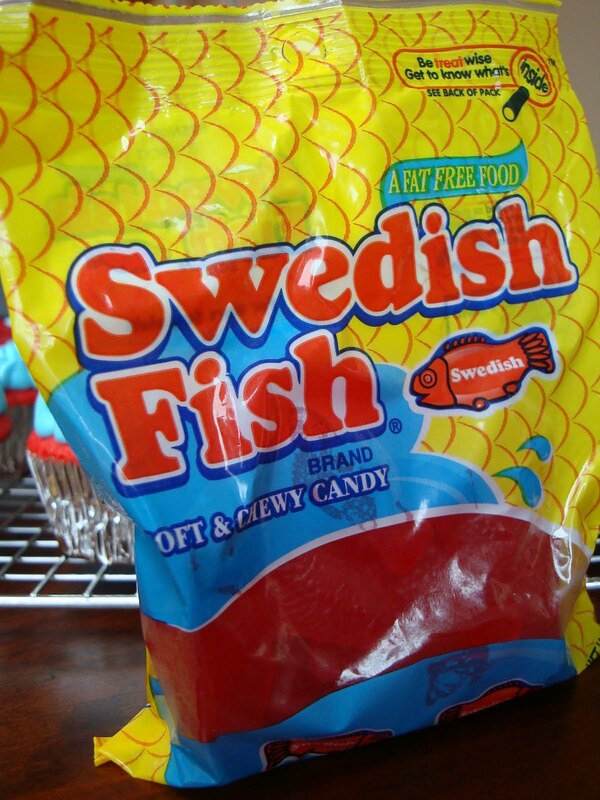 Set aside bowl of swedish fish pieces. Using a stand mixer with the paddle attachment mix together cake mix, jello packet, water, oil, egg whites until just incorporated. Scrape down bowl. Add raspberry flavor and red food color. Stir in chopped swedish fish. Fill each cupcake paper 3/4 full with batter. Bake at 350 for 15 minutes or until inserted toothpick comes out clean. Use icing of your choice. I used Duncan Hines whipped vanilla and tinted it blue. I used tip #104 and piped "waves" then topped with the full size Swedish fish.